Cental & Nature - The villas are the alternative for those who seeking for a little peace of mind. Local Style - One of the best parts of having your own apartment is the chance to experience Ericeira as a local. The Villas, which are the alternative for those seeking a little peace of mind. 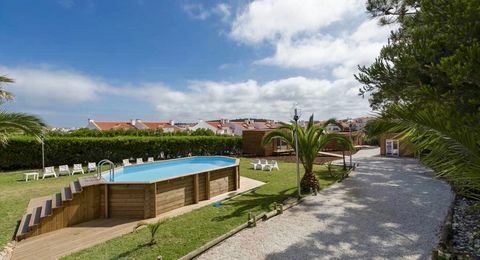 Located in the center of Ericeira , in one of the few premium properties of the village. On the property there is communal pool , parking and several green spaces. The Apartments, which are located in the center of Ericeira Village, one of the best parts of having your own apartment is the opportunity to experience Ericeira as a local. All our apartments have two bedrooms, bathroom, equipped kitchen, living room - do not have swimming pool nor garden. We have lots of advice on how to explore the best of Ericeira. From beaches, to restaurants, museums and shops - we'll help you to live in Ericeira as much as we do. This villa has 3 bedrooms, one bathroom and one toillet, living room and fully equipped kitchen. One of the bedrooms have double bed and other two rooms bedroom with two single beds with the ability to join and make a double king size bed. Possibility of an extra guest - single bed. On the property is pool and outdoor parking and also a number of green spaces. The mattresses and pillows are one of our main concerns - comfort and quality is essential. The villa's decor is minimalist, modern and relaxing. The villa is very spacious (120 m2) with several windows and bright. The build quality is of a high standard and is fully equipped. This villa is a studio - Bedroom, Kitchenet and a private bathroom - No dining space. On the property you will find a communal swimming pool and outdoor parking and also a series of green spaces. 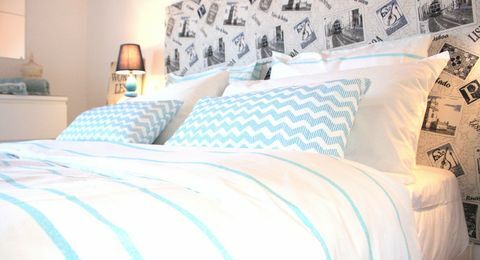 The bed is a queen-bed, the mattresses and cushions are one of our main concerns - comfort and quality is essential. This villa has a master bedroom, a living room, a kitchen and a bathroom. Occupancy possibility up to 4 people. On the property is a pool and outdoor parking and also a number of green spaces. The bed is a queen bed, mattresses and pillows are one of our main concerns - comfort and quality is essential. Decorative items from the villa are on sale - can make the purchase at the reception. The villa is very spacious with lots of windows and lots of light. This villa was built in 2016. This villa has 3 bedrooms, one bathroom and one toillet , living room and fully equipped kitchen. One bedrrom with double bed , and two rooms with twin / double beds - possibility to join the bed and make a king size bed. The villa is very spacious (110 m2) with several windows and bright.